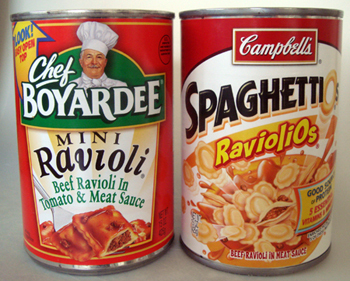 Canned ravioli was my first introduction to ravioli as a kid and I loved it. As an adult I have an appreciation for home-made or restaurant quality ravioli but I have no problem saying there is just something about the canned stuff that’s just so nice in it’s own way. I forgot all about Libby’s as a brand, I haven’t looked them up but I know there was something else they made that I liked, I’ll have to do a little searching later but my only experience with canned ravs has been with Chef Boyardee so I was interested to see what Libby’s was like. This is so familiar, I have a hard time describing it but it’s the lovely mushy pasta squares with an even mushier meat filling. 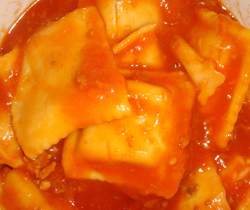 What provides the most texture are the bits of meat in the soupy tomato sauce. 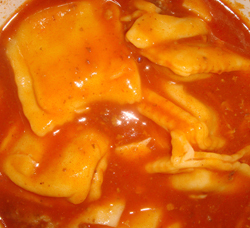 The sauce was lacking a little in the flavor department but provided a nice base for the raviolis to slide around in. Looks almost identical Chef’s but a little more sauce. The texture of the pasta and filling were the same but we both noticed there was more flavor in the ravioli and the sauce was more “tomatoy”. The bits of meat in the sauce were a little less than Chef’s. Both provide the same mushy, slurpy texture (which the 8 year old in me loves) but we were surprised that Libby’s had more flavor and we found our enjoying it more. We agreed that it wasn’t enough of a difference to shun the Chef, he still makes an enjoyable can of mush but since we were evaluating one right after another we did notice Libby’s has a little bit of an edge. Ravioli: Chef Boyardee or Libby's? doesn’t libby’s make corned beef hash? My first thought was, “Ewww, Libby’s make ravioli?” But you just convinced me to at least entertain the mushy thought. Can you put me down for neither? My mom NEVER bought this for us when I was a kid so I guess I missed the window of opportunity to develop a taste for it. I can’t eat it no matter who makes it. Bleh. And Spaghetti-O’s? Oh hell no.